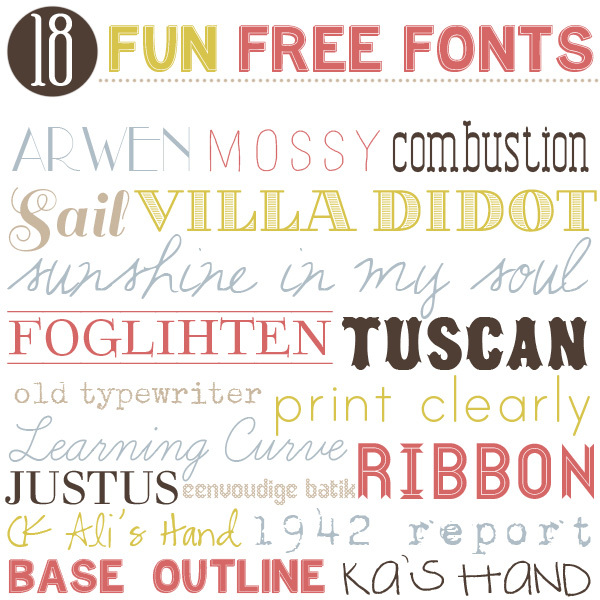 Preparing for Conference, No Time to Blog! It’s Social Media Monday again. Not that I don’t use Facebook on a near daily basis. I check Twitter more than weekly as well. But this was the day I set aside to do my blog. Back in October, shortly after I started this blog, I wrote a short post, #4 is the True Test. On the few blogs I’d started in the past, I was lucky to get to #4 and usually that was my last. I’m up to # 40 now, I think. I’m not out of ideas, and find new ideas easier and easier to generate. What I’m out of, or short on, is time. 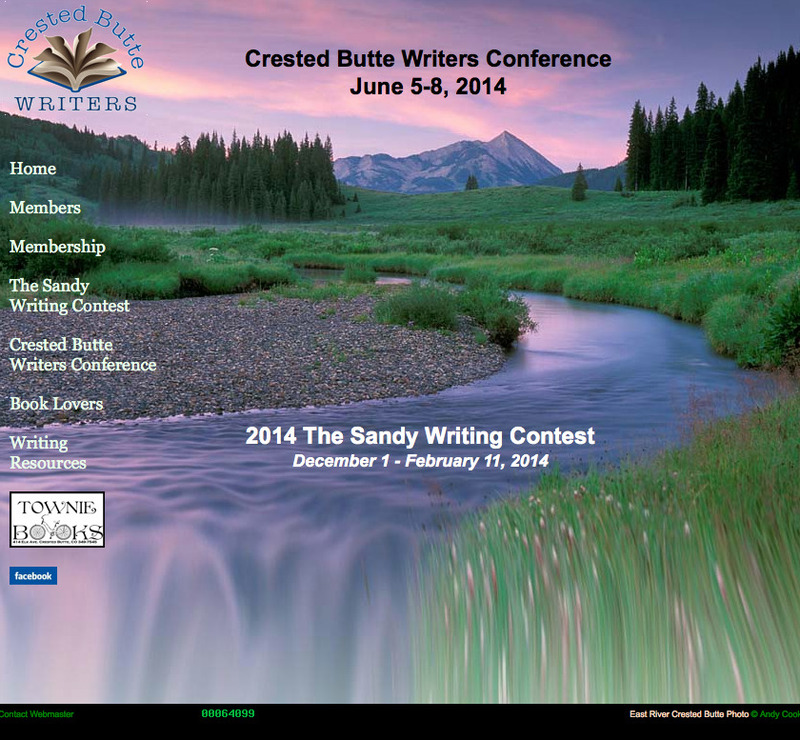 I’m planning on attending a conference in June, The Crested Butte Writers’ Conference, and need to make sure some material is ready by then. Although I did not enter the contest, I have to have pitches and pages ready to go by next Monday as well as a ten-page section and synopsis. This particular conference doesn’t make pitch appointments, but instead has you submit written materials ahead. If one of the attending agents or editors is interested, they will then ask to speak to you and an appointment will be made. The theory is that this is less stressful and saves time on everyone’s part, since the agents won’t have lots of materials from people whose actual writing they don’t like, and the authors won’t have their hopes up unnecessarily. Of course the latter is only true at the time of the conference, not prior to submitting the page and pitch! I attended this same conference five years ago. It is small and more laid back than the larger conferences. Because it is smaller, the number of attending agents and editors may be smaller as well, but the quality doesn’t suffer. In 2009 Donald Maass was a speaker. Again, because it is smaller, you are more likely to get some individual attention without the pushiness that often happens at the larger conferences. For instance, I remember being at one conference when an agent got on the elevator. Before I could even open my mouth to say hello, someone else stepped on and took over. The conference five years ago was the first I attended where a panel of agents and editors commented on your first page. This seems to have become a standard at many conferences such as just completed Pikes Peak and upcoming Rocky Mountain Fiction Writers’ Colorado Gold conference. But my point in writing this is that I don’t currently have time to do much of a post. I have drafts of posts; what I don’t have is the time to spend on them that I’ve dedicated to each in the past. So for the next month I may resort to merely reposting an interesting article or blog post. I’m starting with this one posted by an MFA writer friend from yesterday’s New York Times. It’s short and funny and has a good point! A Master’s In Chick Lit by Karen Gillespie. All you MFAers, what do you think? Music, Writing, Critiques; What Movie Scores Do You Love? Recently a post, The Curse of the Critique Button? 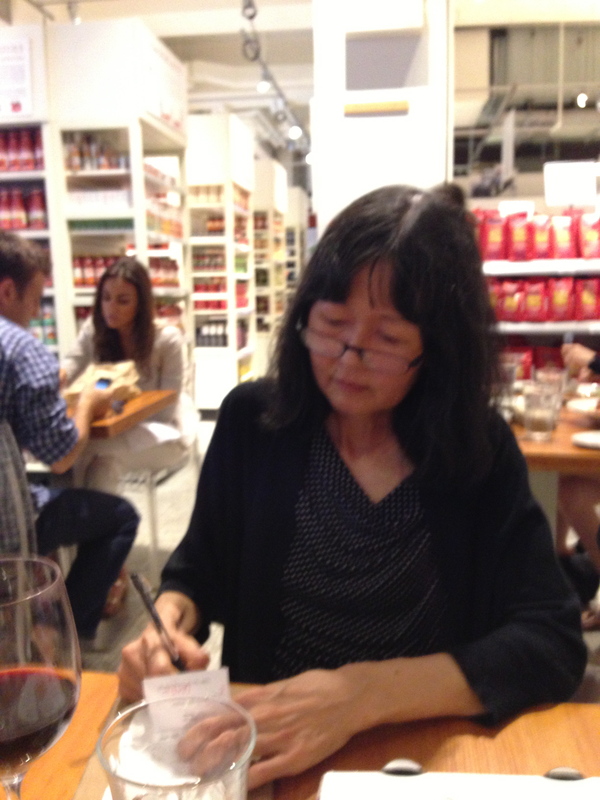 by Pamela Nowak appeared on the Rocky Mountain Fiction Writers’ blog. It discussed the problem of not being able to turn off your critique button when reading or watching movies. As I mentioned in the comments to that post, my first problem with movie watching is the soundtrack. Many years ago I took a music appreciation course for the heck of it. I don’t know a middle C from an F sharp. (Is there an F-sharp?) I learned a number of musical concepts, but what I most remember about this class was that the teacher was very skinny and had his pants cinched with a belt that had at least eight extra inches. He also mentioned that the movie score was what he most listened to at a movie. Up until then, I only noticed the music the few times I’d really loved it, such as in Merry Christmas, Mr Lawrence, or Crouching Tiger, Hidden Dragon. But after he mentioned this, I was more atuned to music. Suddenly, if the music felt manipulative, which it very often did, and told me how to feel, or what the impact of the scene should be, I was pulled out of the movie’s world. I often dislike popular movies and the soundtrack is often one factor why. A good illustration of this, for me, is the difference between the two 1999 movies dealing with World War II ,Saving Private Ryan, and The Thin Red Line. SPR won awards and the hearts of most moviegoers. I thought it had a predictable plot with over-orchestrated music (the chorus in the theme song, for example). TRL, its competitor in a number of Oscar categories, including Best Music, Dramatic Film Score, was, for me, more of a tone poem. I’m not sure either of these composers (John Williams vs. Hans Zimmer) is among my favorites, but I can routinely pick out John Williams’ scores. Being able to recognize a composer doesn’t necessarily degrade the quality; I usually know Phillip Glass or Ryuichi Sakamoto, too. For me, it is a heavy-handedness and manipulative element that makes me like most John Williams scores less than others. In my original blog post comment, I suggested there might be a correlation between musical scores that direct your feelings and good writing. Although subjective, I find writing I most enjoy to be that which is similar to the scores I prefer: ones that actually make me feel rather than those that dictate how I should feel. In writing this is illustrated by the difference between telling me how a character feels and allowing me to feel what the character does. Although I suspect I fall far from my ideal, that is what I usually strive to do. Maybe if I listen to more of the music that achieves this state, my writing will approximate that level of art. What movie soundtracks with original music do you find most enjoyable? Do you feel the sort of music you prefer, as illustrated by film scores, also informs your writing or what you consider good writing? The New York Times Book Review routinely asks the question above in its author interviews. Often, the books mentioned make me feel illiterate or at least lacking in erudition. I cheated a little on my own list below since one of the books I’m about to mention was actually on my chest of drawers. I relocated it to my bedside. 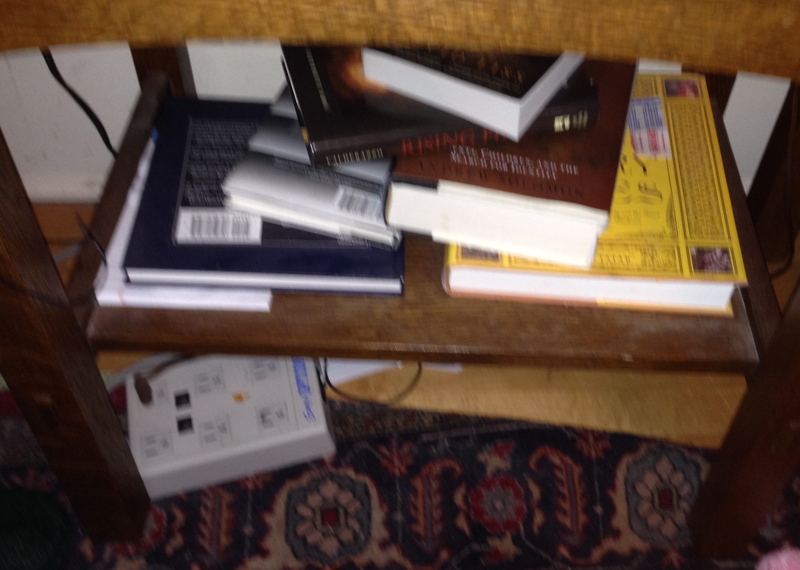 Here is a picture of the books that were next to my bed on Saturday, April 5. And here is each book with a short comment. 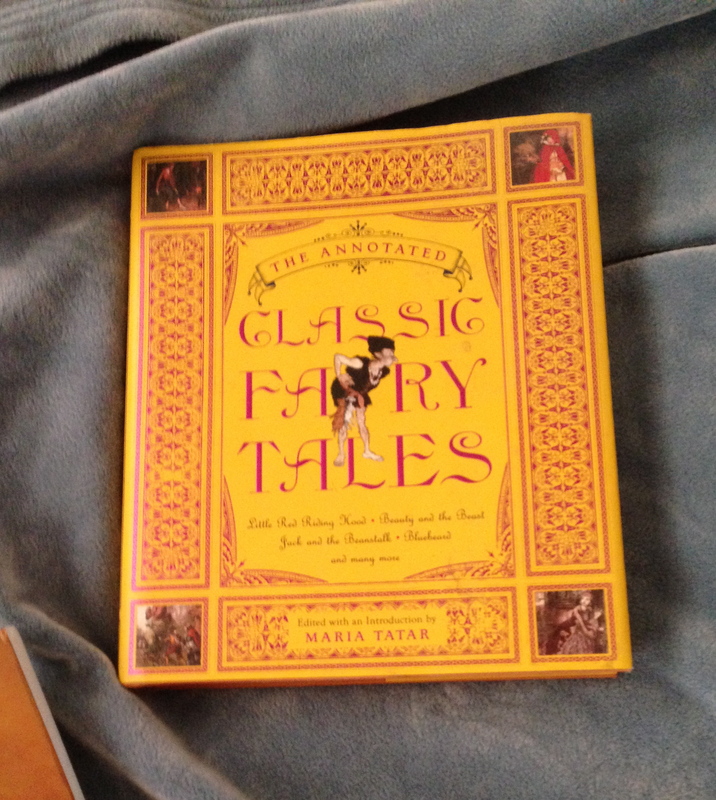 I’d totally forgotten I’d asked for a copy of fairy tales for Christmas–in 2010 maybe! My idea was to read one per night so I could incorporate them into my work. I might have looked at one entry. 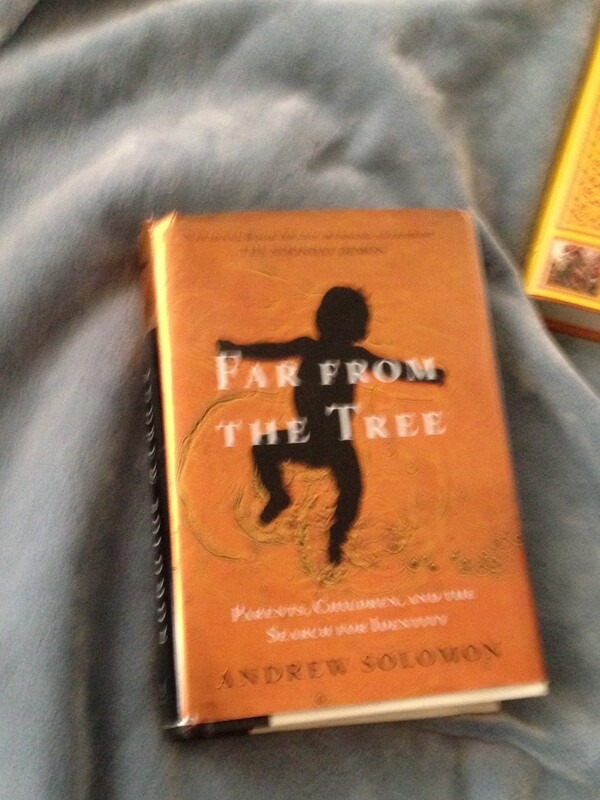 I asked for FAR FROM THE TREE for Christmas 2012. I read half of it and found it very interesting, but I had hopes of finding others who would like to read and discuss it. This book was probably my newest acquisition. I’d read SENSE OF AN ENDING and loved it, but I found this one difficult to get into. Too fragmented, and then when I was reading it at night, the fragments were fragmented. I loaned this to my friend N. so she could read the section on The Mommy Brain while I read about rearing babies the French way (see previous post). Although THE FEMALE BRAIN is interesting, it is more like a textbook that BEBE and I elected to finish BEBE before soldiering on in this one. I’m close to done. 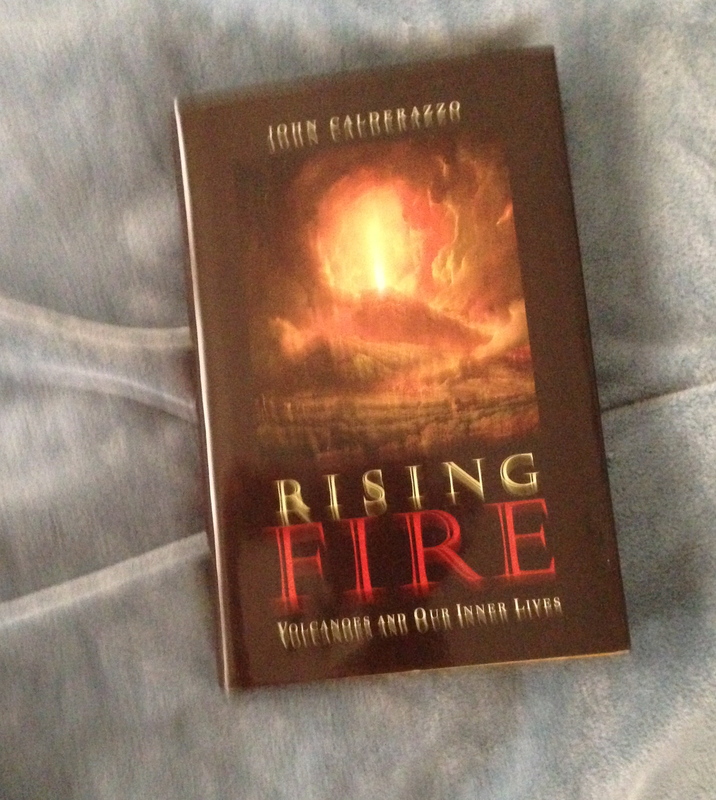 RISING FIRE was loaned to me by a writing friend. 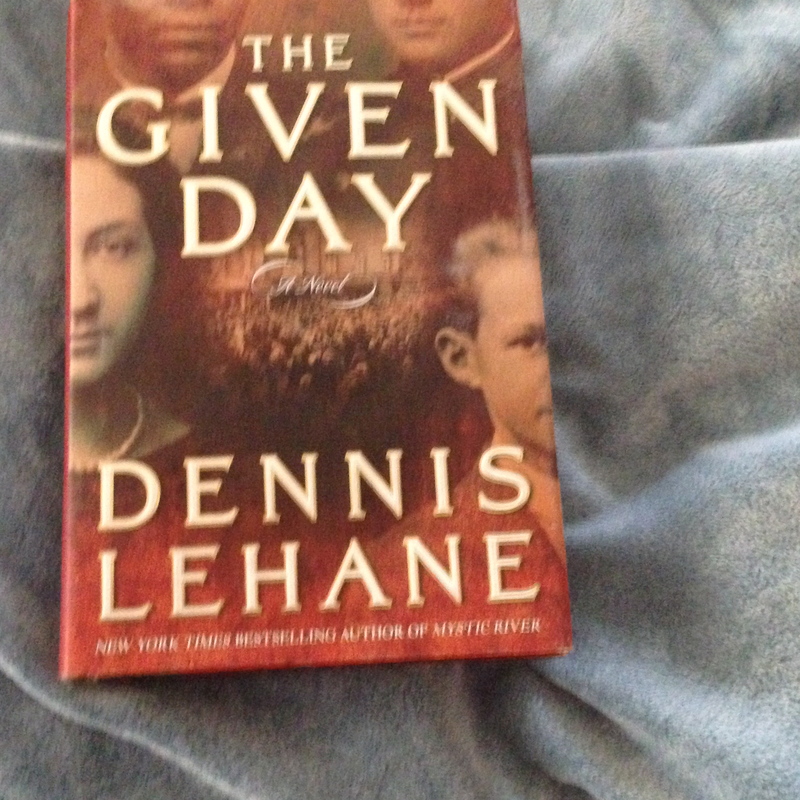 I read the beginning and it is next on my reading list. It is written by a Colorado State University professor whom I once met at a picnic. I think he’s a friend of friends, too. Narrative/creative nonfiction isn’t my go-to style of writing, but after enjoying writing my blogging, I’m rethinking this as a possible creative outlet. 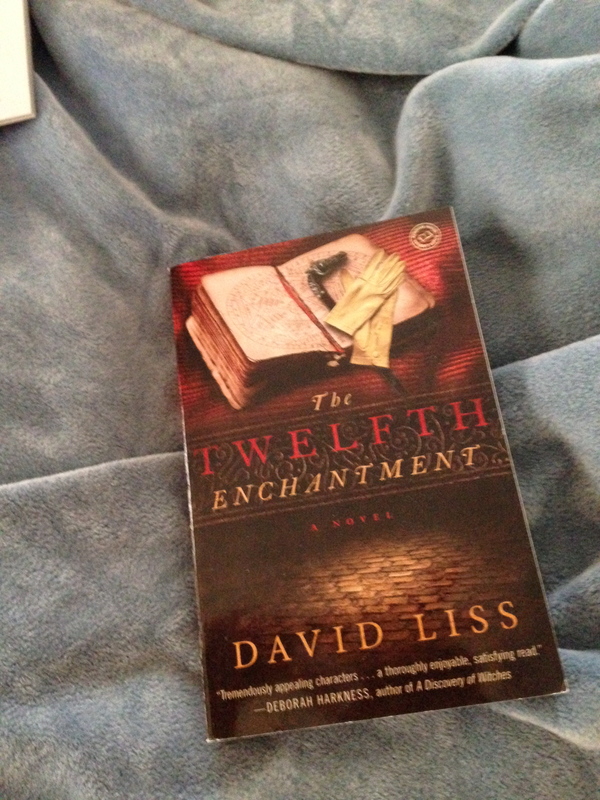 I started this novel, which I bought at an estate sale. I’ve seen Mystic River, of course, and enjoyed it, but I’d never read the author. The price was right so I picked this copy up this summer. Somewhere along the line. I started reading it, and even though I’m not a baseball fan, I enjoyed what I read. 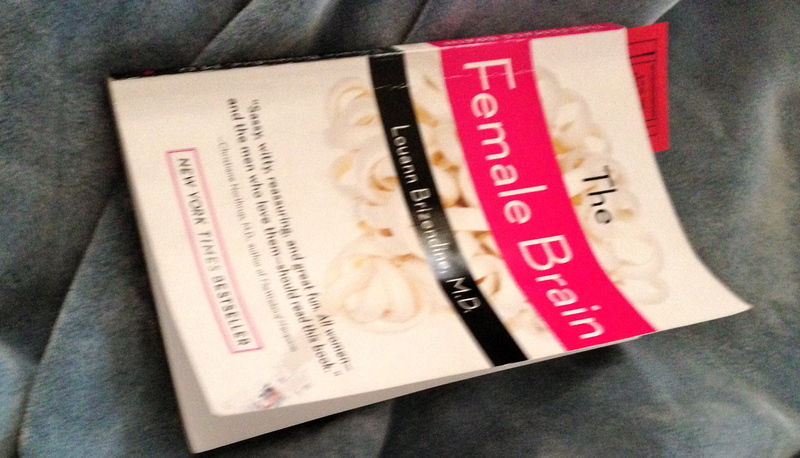 I put it aside to read THE FEMALE BRAIN. 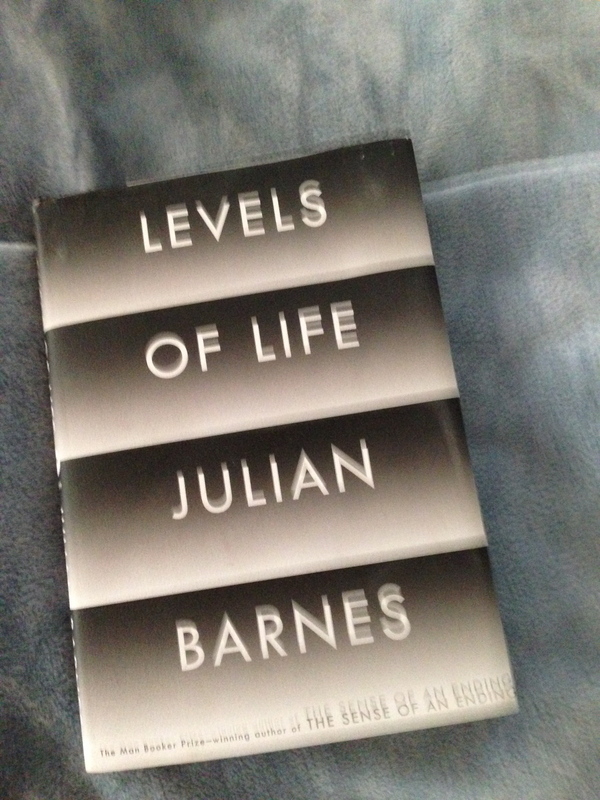 I may go back to it and read it concurrently with the nonfiction above. 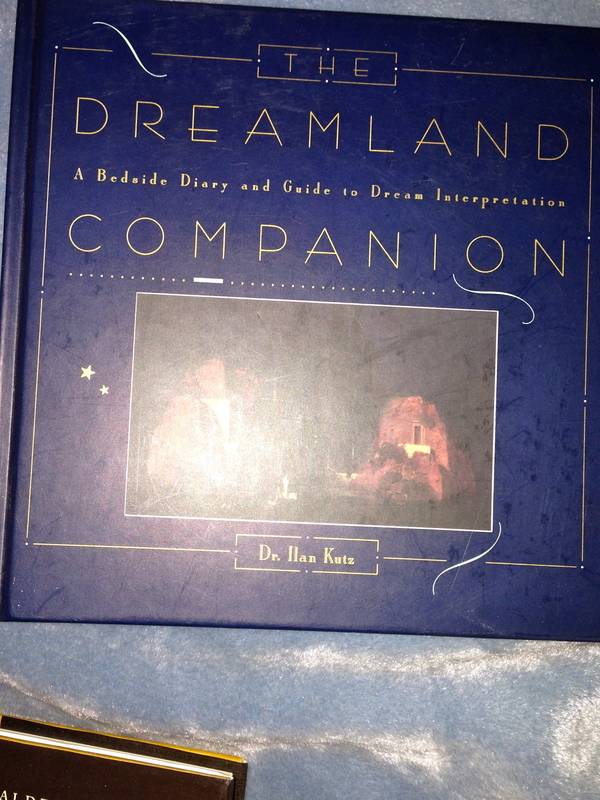 My last “book” on the nightstand is a dream diary. I’ve read up on dreams and kept track of dreams at various times in the course of my life. It’s waiting for me to remember a dream and write it down. 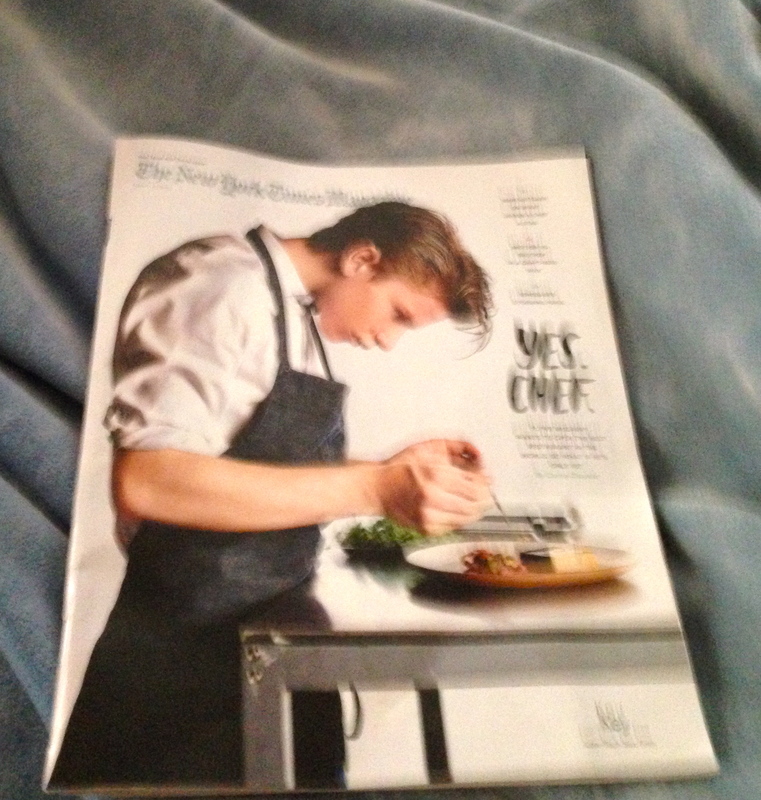 The last item on my nightstand is the cause of me being behind on my reading. My goal every week is to finish the Sunday Times by Saturday so that I can start fresh the next morning. Sometimes when we’re away for the weekend, I ask my neighbor to please, keep the paper, so I can get a head start on other reading, but she usually gives it back to me anyway. I’ve read the Sunday Times since I was a teenager. Probably I should say I read parts of the Times. We subscribed for the Book Review. If I read the whole paper all the way through, I’d be like my college friend June who saves the paper to read later but never gets around to it. June last summer in NYC. I’d probably read more books if I restricted myself to reading a few articles on line or had the Denver Post delivered instead of the Times. My latest excuse? You never know where an idea for a blog post might come from. I have a draft for a post generated from a story in last week’s edition and while glancing through today’s Styles section a feature caught my eye. I may want to address that issue here as well. What books are next to your bed or wherever you tend to read? Better off French? The writer and French children’s Literature. A friend of mine has a 1-year old whose father is French. When N. was pregnant, I bought Pamela Druckerman’s Bringing Up BeBe for the parents-to-be. I thought it might have some good advice and I wanted to know if it mirrored J.C.’s experiences. I’d read an excerpt in the NYTimes and thought the “method” sounded promising. I have since borrowed back the book to read. I don’t have any children, but I enjoy reading on different subjects. As a writer, you never know when information will come in handy or present an idea for a story. The son of N. and J.C. Photo by his mother. 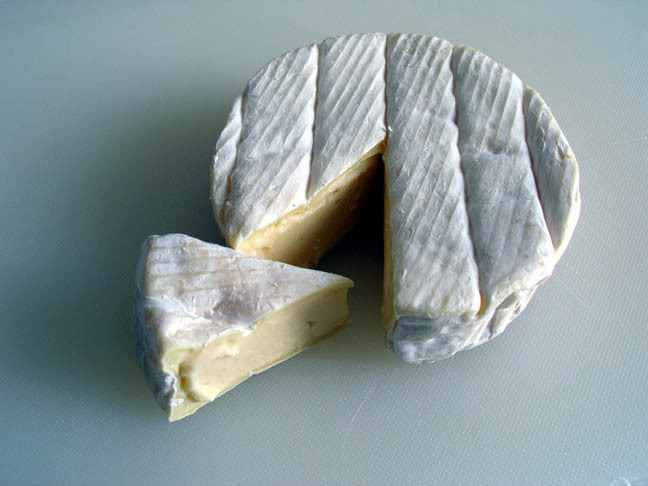 All in all, most of the techniques described make sense, partly because, other than being served Camembert at 18 months, the style of parenting appears much like what my mother and other of my parents’ generation would have espoused. It sounds as if French children are far more internally motivated and less demanding of attention than their typical American counterparts. Now, there are caveats. Druckerman herself says what she describes applies mostly to parenting in Paris and, possibly, mostly to a particular socioeconomic class within Parisian society. Although she cites experts and other works, the book is based mostly on observation, not hard research. What struck me as the reason I might be better off French was the short section on French children’s literature. Druckerman writes of American children’s literature, “…there’s usually a problem, a struggle to fix the problem, and then a cheerful resolution.” She adds, “… every problem seems to have a solution, and prosperity is just around the corner.” (p. 162) French stories, she says, start in a similar vein with a problem and struggle to solve the problem, but the solution doesn’t seem to stick for long and often there is no personal transformation or growth. Her interpretation of the less-than-perfect ending? That life is complicated, and no one is completely good or completely bad. What I desire is the ability to write “reality” without having to be considered literary. I don’t think my writing is insightful enough,”deep” enough, nor is the prose exceptional enough for that tag, which leaves “women’s fiction” the only category available to me. I’m not sure my writing meets the standards for this nebulous genre/category, defined at findmeanauthor.com as tapping “into the hopes, fears, dreams and even secret fantasies of women today.” The Women’s Fiction Writers Association exists for those who write about “stories about a woman’s emotional journey.” Other than the fact that women are the main characters, I still don’t see how this is different from what was once called mainstream fiction, and that’s why it might have been easier for me if I’d been French!